St. Paul’s bought this magnificent pipe organ from St. John the Divine Church in 1912. She is a tracker-action instrument, and has 4 divisions: Swell, Great, Choir and Pedal Organ. It was built by the Peter Conacher Co. Ltd. of Huddersfield, England. The organ has a very handsome front, richly decorated in tints and gold. Of far more consequence, the parts of the instrument are carefully finished, even in the most minute details and the musical qualities of the organ are exceedingly beautiful, especially the reeds in the swell and choir which are full and at the same time, mellow in tone. The diapasons, too, are sufficiently powerful, and are entirely free from coarseness. Loving care has been given to the organ over the years. Few changes have been made, but it still can be hand pumped with the original lever. In fact, a fire in Esquimalt in 2003 interrupted electricity and the morning service was completed with the use of the hand pump. Since the year 2000, there have been 16 recitals with the proceeds going to the maintenance and repair of the organ. In February 2006, the Parish of St. Paul’s was presented with a plaque from the Royal Canadian College of Organists, recognizing the heritage status of the organ. The plaque is mounted on the wall near the organ itself. As of 2006, the organ is 115 years old. Received from: Henry Saunders, Esq., 39 Johnson Street, Victoria, B.C. An order to build an organ for St. John’s Church, Victoria, B.C. To be completed end of March, 1891. The case of best selected pitch pine varnished. The front pipes to be of strong zinc and illuminated in gold and colours. The organ to be built of the best possible materials throughout and of first class workmanship. The voicing to be carefully executed and carried out in an artistic manner, great care being exercised to give each stop its true character of tone. The draw-stop knobs to be of rosewood with engraved ivory shields. The draw-stop knobs and jambs to be placed at an angle of 45 degrees. English Tin and to be well made the Diapason being especially heavy so as to produce a rich, round mellow tone of true Diapason character. The spotted metal pipes to contain 50% of refined English Tin and to be well made. The Swell Box to be made of double boards 2” thick and to be lined with cardboard. The organ to be completed in our works and carefully packed in cases, those containing the most delicate parts to be lined with zinc and delivered F.O.B. Liverpool, for the sum of Six Hundred Pounds. £567. net. P. Conacher & Co. Limited. ORDERED A NEW ORGAN: It has been decided by the congregation of St. John’s to add to the many attractions of this pretty church, a new and powerful pipe organ, the order for which has already been sent to England. Nothing unforeseen occurring to delay the arrival of the instrument, it will be here and in it’s place within six weeks time and undoubtedly the finest instrument of the kind in Western Canada. ST. JOHN’S ORGAN: A few days ago it was somewhat prematurely stated that a splendid new organ had been ordered from England for St. John’s Church. What is being done in this direction is to provide ways and means to procure an organ which is expected to cost about $4000 and be the finest instrument in British Columbia. A subscription list toward the purchase of the organ will be opened in a few days, and it is hoped that liberal donations will quickly be handed in. ST. JOHN’S NEW ORGAN: The Finest Church Instrument on the Coast North of San Francisco to be played Sunday. Brief description of stops and mechanism — An Organ Capable of Producing Grand Music. St. John’s Church, for the past week or more, has been given over to the organ builders, and the interior of the sacred edifice bears, just now, the appearance of a large and busy workshop. The labors of Messrs. Goodwin & Co. (Goodwin & Co. was Victoria’s very own piano manufacturer) and their staff, are however drawing near a close, and by Sunday the new organ, the finest on the coast north of San Francisco, will take its part in the services. The new organ, of which a fair idea can now be gained, is a handsome as well as excellent musical instrument, a lasting monument to the enterprise of the congregation, and to the thorough manner in which the builders – the old Huddersfield firm of Peter Conacher & Co., have performed their work. Its cost, including $800 duty, was a little more than $4,600, exclusive of the water motor by which the bellows will be operated. The order was placed some five or six months ago, and the instrument was carefully constructed, of the very best materials, upon the specifications given hereunder. Mr. Hookway will preside at it in future, playing for the first time on Sunday, when only a portion of the organ will be used. The work of tuning, etc.. will be completed in another week or ten days, and a grand recital will be given on the evenings of June 2nd and 3rd, on which occasion Charles Harris the noted composer and organist, of Montreal, will play, and several solos will be sung by Master Frederick Williams, the famous boy soprano, of London, whose appearance is by express permission of the Vicar Choral of Westminster Abbey. GRAND ORGAN RECITAL at St. John’s Church by Mr. C. A. E. Harris, Organist of Christ Church Cathedral, Montreal, assisted by the famous boy soprano, Master Fred Williams, from Westminster Abbey, London, England on Monday and Tuesday, June 1 and 2 at 8 o’clock, sharp. Admission: (by Ticket only) 75 cents. …The recital possessed unusual interest. Aside from the fame and reputation of the two distinguished artists who participated, it was the first opportunity that the congregation of St. John’s and the people of Victoria have had to listen to the full splendor and rare qualities of the magnificent new organ that has but recently been placed in the church. Touched, as it was, by a master hand… the great instrument poured out in richest grandeur, music such as has never been heard on Vancouver Island. Under the skillful and delicate manipulation of Mr. Harris, the full strength of the grand organ was developed, and its strains reverberated through the church in the softest harmony. The most difficult compositions of the great masters were rendered during the evening, only possible on an instrument of this character. Organ and organist were both unequalled, and the large audience that completely filled the building were the recipients of a musical entertainment such as is seldom listened to, and the congregation of St. John’s can feel the assurance that it possesses one of the finest great organs in the world. Master Frederick Williams, the boy soprano, is a lad of but 10 years, but his remarkable voice gave evidence of, not only careful training, but a rare and wonderful natural gift. His notes are remarkably clear and flute-like and as perfect in the difficult upper registers as in the ordinary passages. (He sang two numbers, “”With Verdure Clad”” – Hayden and “”the Children’s Home – Cowen). The child is a remarkable musical prodigy, and the large audience enjoyed his two numbers immensely, although forbidden to applaud by a polite request attached to the programme. The programme for the second concert or June 2 included Overture to “”Samson”” – Handel; “”Funeral March”” – Chopin; air “”I Know That My Redeemer Liveth”” – Handel by Frederick Williams; “”Triumphal March”” – Harris; “”Andante From C major Symphony”” – Beethoven; air “”Angels Ever Bright And Fair”” – Handel, by Frederick Williams; “”Grand Offertoire in D minor”” – Batiste; “”Wedding March”” – Mendelssohn, By Mr. C. A. E. Harris. 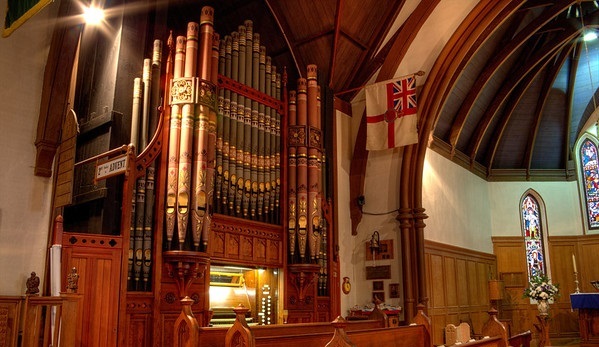 In 1912, the Parish of St. Paul’s Esquimalt bought the unique pipe organ from St. John The Divine Church when the latter decided to build in another location. Great Organ – #7 Quint, 2 2/3 ft.
Great Organ – #9 Scharff III, 1 1/3 ft. Swell Organ – #10 Sesquialtera II. Choir Organ – #18 Quint, 2 2/3 ft.
Choir Organ – #21 Principal.